Have I mentioned that I am a contributor to Dine out Dietitian? A site dedicated to offering YOU, Dietitian approved insider tips to nutritious fare while dining out all over the U.S.! Plus, if you’re a frequent traveler then this site is definitely for you. I can’t tell you how many clients I see that experience anxiety over traveling when trying to be healthy, as travel often involves lack of nutritious fare, long periods of sitting, meals out, and situations out of one’s control. But, to mitigate this anxiety, Dine out Dietitian was created to offer healthy restaurant option in various regions throughout the country. The RD contributors offer ordering suggestions, explanations of the dishes we selected, and insider tips when dining out. So, next time you travel be sure to check out some of the restaurants that made the cut in your visiting city! 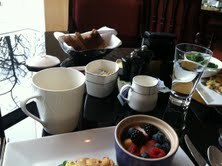 My most recent review was on Bristol Lounge (Four Seasons Hotel), in the city of Boston. If you are looking for an upscale, healthy breakfast, look no further. Depending upon your mood you can order off of the sweet or savory menu. Of course, if you are trying to be health-conscious, stick to savory. You have a couple of healthy options to choose from on this menu, which I love! Their menu doesn’t leave you scouring for hours trying to find something nutritious to eat and they are more than willing to make modifications, not that much are needed. 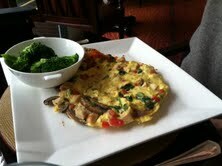 I went with the eggbeater frittata (so delicious! ), served with a plethora of vegetables. I didn’t have to choose from potatoes, sausage, or bacon, but could rather choose from 1) Mixed greens or 2) Fruit. As if the healthy options aren’t already endless enough, you can wash down your meal with a “Sunrise on the Charles” smoothie, packed with carrots, ginger, and blueberries. Or if you are more of a green goddess, you can opt for the kale, apple, and celery smoothie. What isn’t to love about a place you can feel good about going to! Click here check out my other inside tips and read my full review. When it comes to food, there is nothing I love more than a good Brunch. Though my recent work schedule has prevented me from frequenting brunches with some of my favorite ladies in the #BostonBrunchers group, I was lucky enough to be able to attend the latest gathering. And boy am I glad I did! 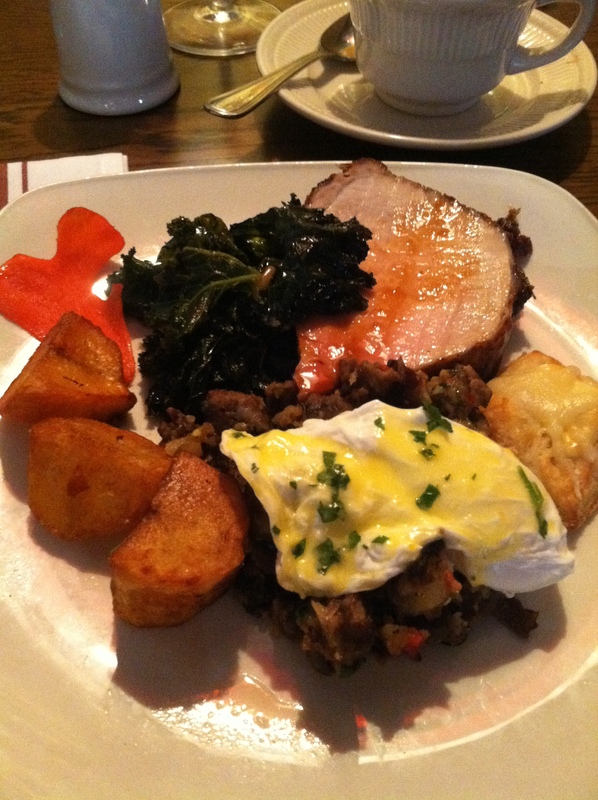 Boston has quite the hopping Brunch scene, and one of the places on your Go-To list, must include Towne Stove and Spirits. Their menu changes weekly, so when we arrived we were first greeted with glasses of prosecco and coffee and a first course of (my fave) Oysters! 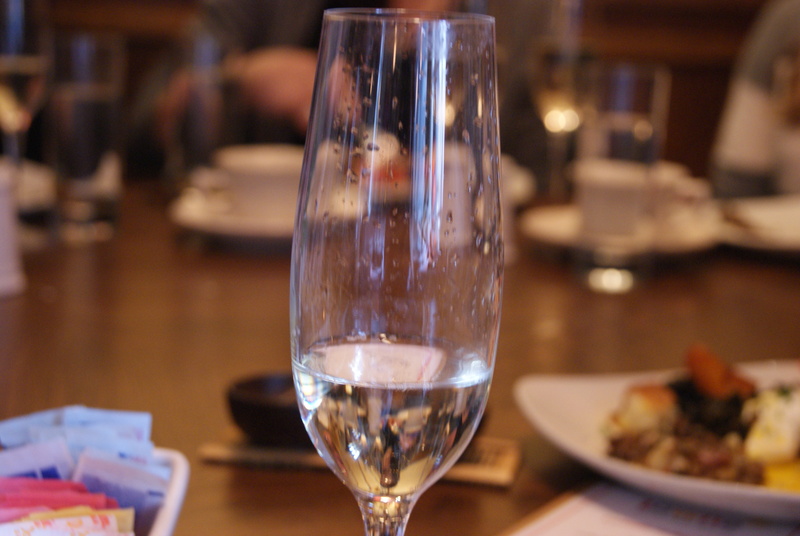 I should back the story up a bit by saying I actually arrived late because I had to work, so when I was taken upstairs to the table I first saw just a man with a glass of prosecco. I couldn’t see the rest of the brunches behind the curtain so when the hostess insisted that that was our table, I kindly replied ” Um..no..that’s a man..we don’t have men in our group!” Well- in fact we do! Welcome to the group Alex! Anyways, after I was sat and settled with my coffee and libation, we were asked to go indulge. The first course arrangement included a cobb salad, shrimp, fruit smoothies, crab, smoked salmon, and a cheese assortment. 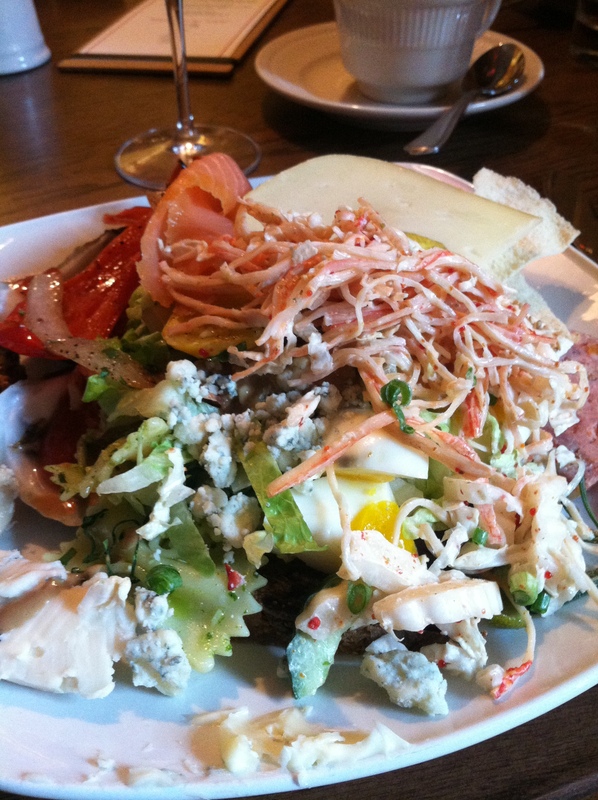 If you don’t enjoy brunch, at least go for their cheese platter and warm bread pudding. Living with someone who eats paleo, I don’t often get to eat cheese so you can bet I enjoyed every single one of the cheeses they had to offer. As you can see I kind of went with the unorganized messy approach and just went to town (literally! ), as it is an all you can eat buffet. The second course consisted of maple glazed pork (yummy! ), with a maple syrup glaze. 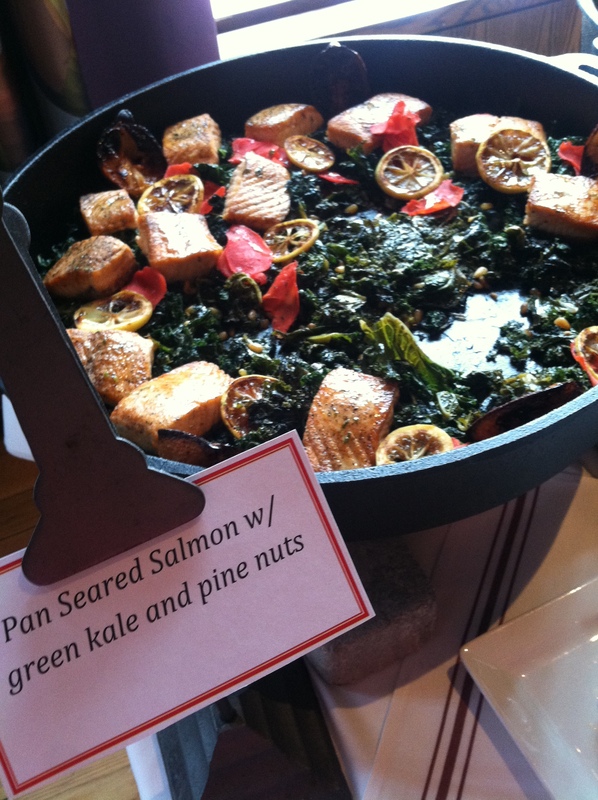 The salmon and kale were also really delicious and cooked to perfection. There was also a carving station, made to order omelets (which I unfortunately did not try), and an entire breads and pastries section. 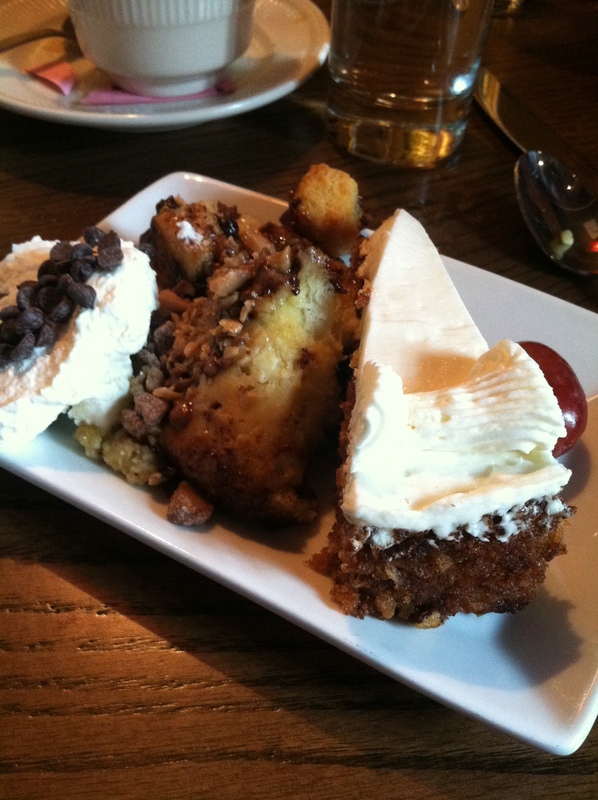 Pacing myself for dessert was a challenge. 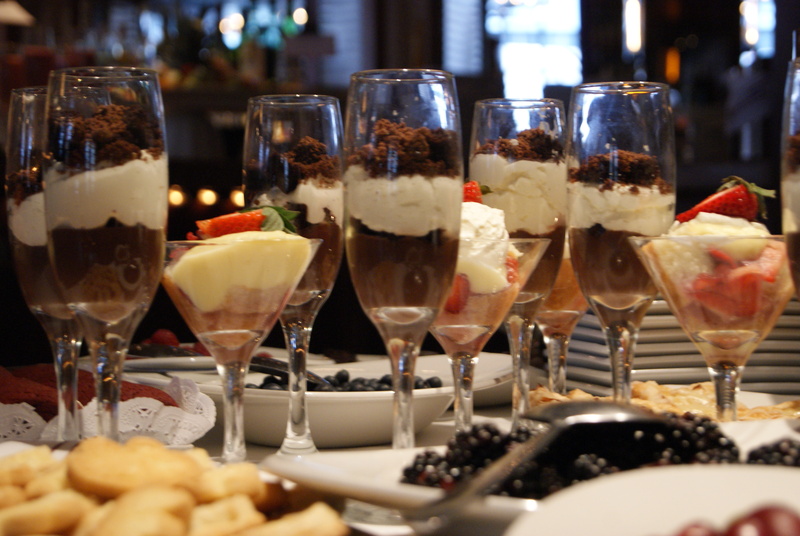 But, between mini red velvet whoopie pies, chocolate mousse in champagne glasses, and of course their famous warm bread pudding with layers of deliciousness, chocolate bits, and topped off with whip cream, how could I say no? I was in dessert heaven. 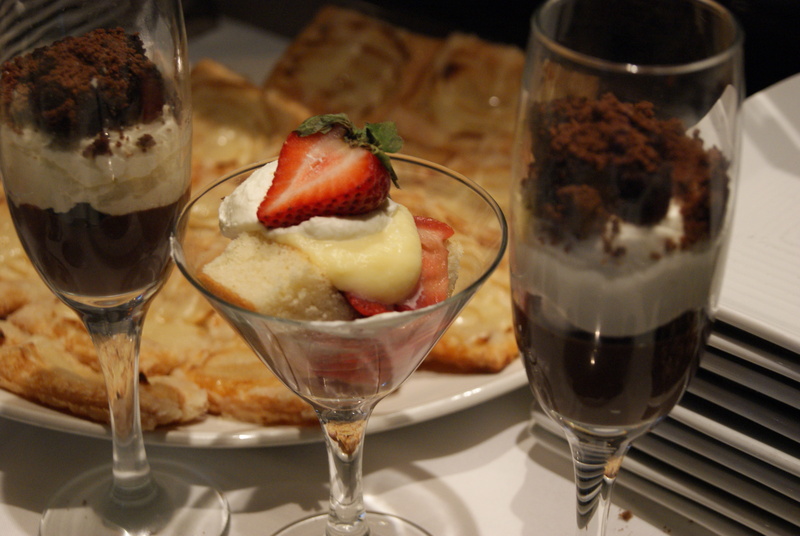 “a delightful mingling of international flavors & solid american fare,” was had by all! On a side note: Fun brunch promo! : The Sunday after Black Friday (Sunday, December 1), Brunch guests will receive a free house-made candy bar (layers of handmade caramel and cookies dipped in milk chocolate) as a way to fuel up before hitting the Pru/Newbury Street for holiday shopping. 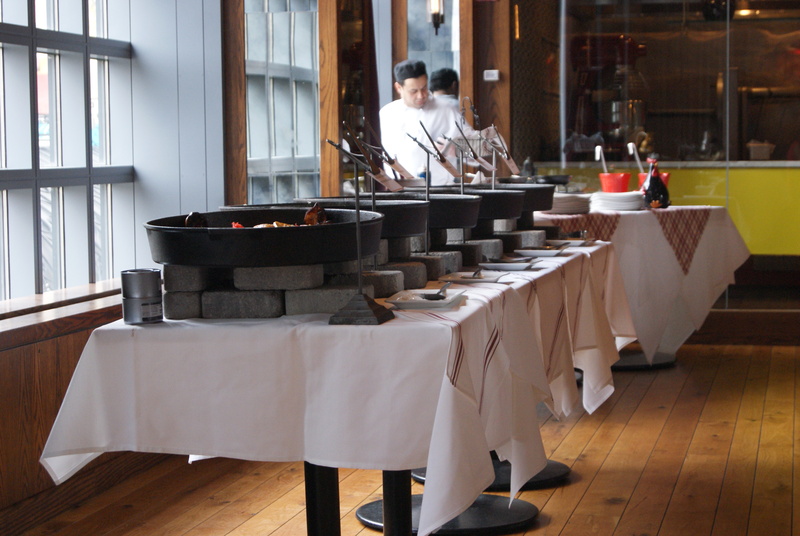 Note: Towne Stove and Spirits provided the Boston Brunchers this brunch free of charge. But all opinions expressed here are my own.